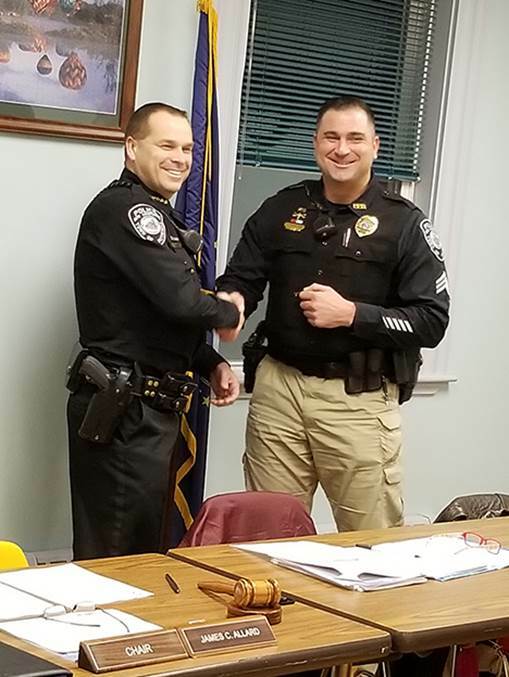 Pittsfield Chief of Police Joseph M. Collins (l) presents Sgt. Joseph Di George (r) with the Silver Star for Bravery and Life Saving pin. I would like to formally acknowledge and present Sgt. Joseph P. Di George with a Silver Star for Bravery & Life Saving Award. On March 21, 2018 at 17:23 hrs. Sgt. Joseph Di George responded to a house fire at 11 Thompson Road in Pittsfield, New Hampshire. Sgt. Di George was first on scene and found a fully engulfed house fire. As he approached the house on foot he was met with extreme heat from the fire and heard explosions from ammunition stored in the house. Sgt. Di George didn't slow down and made his way around the house to find two subjects standing on the back deck. One subject struggled to walk and attempted to go back to the house, so Sgt. Di George carried this subject through the snow to safety. 1. Silver Star for Bravery - The Silver Star is awarded for extraordinary heroism performed in the line of duty. It recognizes an officer whose act of courage goes above and beyond the call of duty. 2. Life Saving Award - Issued to anyone whose actions saved the life of a fellow citizen in an emergency.